I am sure most of you that decided to read this post are thinking “WHAT”? That’s what I said when I first heard of plopping or plunking wet curly hair. I have learned an important lesson while doing some research on plopping. Curly hair looks its best when you DON’T use a regular towel to dry it. Since plopping I have found this to be true. There is something about the fibers of a regular towel that make it frizzy. Since I started plopping I am amazed at how many people have said “your hair is really curly “. I have been doing nothing different from plopping. I usually plop my hair for 20 minutes let it down and then blow dry my bangs. Everything else continues to air dry. On the first video I watched about plopping they used a long sleeve t-shirt. Since I live in Florida and don’t own one of those I decided to make my own towel out of some knit fabric I had laying around. This is what it looks like. It is a single layer of the knit but you could cut two pieces and sew them together for a thicker towel. My hair would be considered medium length and thick, the single layer works fine for me. This morning while I was getting ready to work out in my yard I thought to myself “I am tired of sand getting in my hair every time I work outside”. 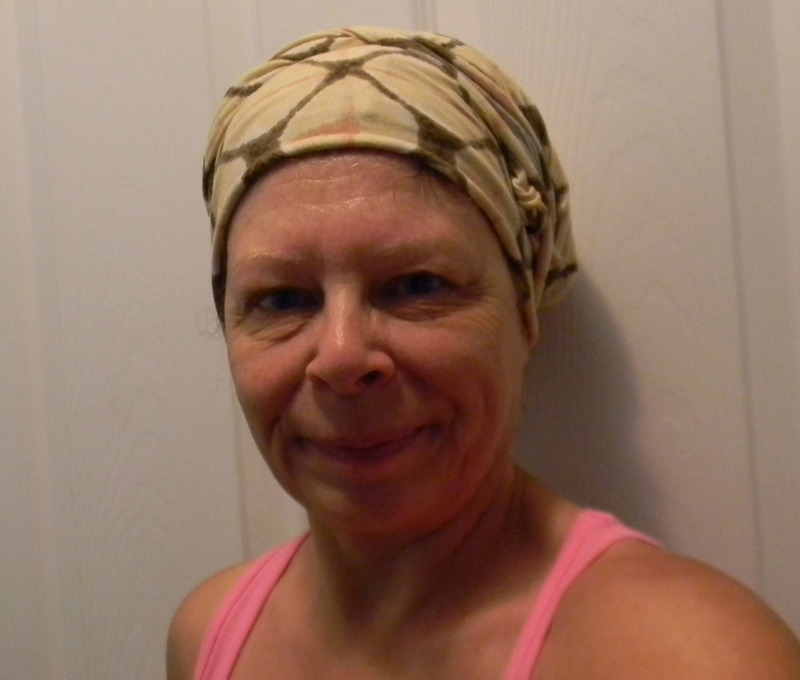 Then it dawned on me, why not use my plopping method to keep my hair clean while gardening. My plop worked great! Here is a great video on plopping. 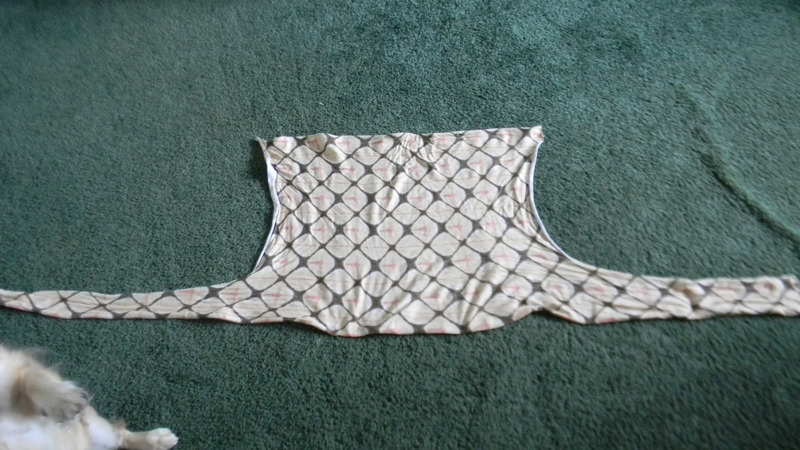 When I plop I bring the two corners of the back to the front so that I don’t have fabric hanging on my neck. I even thought about sewing a little piece of Velcro so that it would stay together but haven’t gotten that far yet. It’s a little tricky the first few times you try it but once you get the hang of its easy. This entry was posted in Daily Life, Gardening, Posts and tagged gardening, gardening and hair, Hair, keeping hair clean while gardening. Bookmark the permalink. I tried this “plopping,” for the first time last wash. It worked very well and combines well with my current attempts to go naturally shampoo free. I’ve been spending way too much time and too many products on trying to tame my naturally curly hair to be straight and have decided to just learn to appreciate it and how to work with it. This “plopping” method works great. It helps the hair dry slower and more evenly. I have even comfortably slept in it at times. Then in the morning, just shake the hair out and style into place with my fingers. I just read about making a natural detangler and hair gel with a mixture of boiling flaxseeds and water. I like your idea to make some out of some fun print T-shirt materials and also the velcro. Would look great working in the garden too. Thanks. Thanks for sharing your results. My hair has not always been curly. Amazing how that happens. Mine is beginning to gray so it probably won’t stay curly but will still use this method to keep my hair clean when gardening.